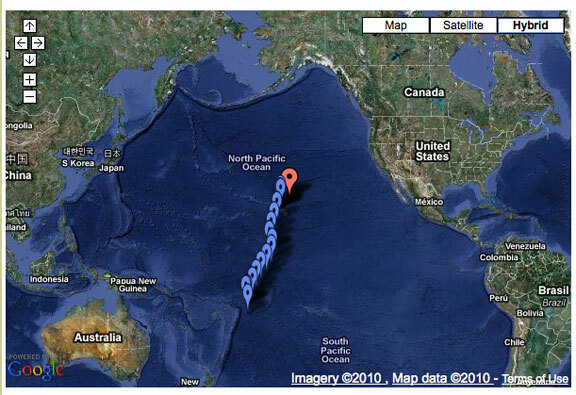 The second FPB 64, Sarah Sarah, is on her way from Hawaii towards Seattle, a 2300 mile passage. The crew just sent in the report which follows. If you’ve been following our charted progress on SetSail.com, then you already know we’ve been on the island of Oahu in Hawai`i for more than a week. With this update, we’ll catch you up on what’s been happening since our last update. After a 4-day, 3-hour and 17-minute passage from Palmyra, on the evening of September 28 we arrived at the Hawaii Yacht Club dock in Ala Wai Harbor, Honolulu, just after sunset.We covered the 973 nautical miles from our anchorage at Palmyra to this dock in 4 days, 3 hours and 17 minutes. That works out to an average an amazing 9.8 knots or 235 nm/day! Some members of the yacht club aided us by making room at the large dock adjacent to the club house, and member Mike Phillips was kind enough to provide us each with a temporary membership. We met a number of members throughout our 6-day stay who were curious about our unusual-looking vessel, several of whom came aboard for closer inspection. Thanks to our location near the business centre of Honolulu, we were able to take care of a few tasks that had come up during our voyage from New Zealand, as well as to supplement our provisions. While we did have some of our meals onboard, we frequently dined at the yacht club or in town. Dave, a long-time friend of Bill’s, flew in from the mainland to join us for the final leg to Washington. John, who needed to return to his own boat in Oregon to prepare for a departure to Mexico, flew out the next morning. We wish him well on continuing his own, single-handed, adventure! On October 4th, the three of us (Bill, Brian and Dave) moved the boat from Honolulu to Ko Olina Marina, near Barber’s Point, Oahu, where we topped-up our main diesel tanks, taking on nearly 2000 gallons. This modern marina provided a more relaxed location from which to await a weather window for our departure. One day a large sea turtle was feeding along our dock, and we periodically swam in some nearby lagoons. We also enjoyed the benefit of having shore-supplied electrical power for the first time since we left Whangarei, New Zealand. Our slip was located directly across from a large pirate ship recreation, which we’re fairly sure was used for the “Pirates of the Caribbean” films. It probably isn’t a coincidence that Disney is building a resort nearby. Bill’s brother-in-law, Jim, who lives on the island, was able to visit us one day at the marina. He was even kind enough to give us all a ride to a shopping centre in a neighbouring town to do our final provisioning, and then return us to the boat with a large load of groceries. Finally, with the weather looking promising for an anticipated 10-day crossing, on the morning of October 7th we left Ko Olina and Oahu, heading for Cape Flattery, Washington. Once again we had a dolphin send-off. At sunset on our first day at sea, a large sea bird (perhaps a booby?) alighted on our fly bridge awning, the canvas of which we’d rolled back just before our departure, leaving only the aluminum frame. He (we’ll assume) had bright red-orange webbed-and-clawed feet with a long, pointed light-blue bill that turned pink near his head. His feathers were white, with the exception of a black trailing edge on his wings. He was surprisingly tolerant of our presence, even when we stood below him only a foot or two away. He stayed at his perch – leaving his mark – throughout the night, flying off only when Bill finally shooed him away after dawn. We’ve now been underway nearly a day-and-a-half, and thus far the weather has been very good with the seas providing little more than a gentle rocking. The skies have varied from mostly-clear to mostly-cloudy; last night was very clear with thousands of stars under a moonless sky. This entry was posted on Friday, October 8th, 2010 at 10:39 pm and is filed under FPB 64 Updates. Both comments and pings are currently closed. I am very interested to hear Sarah Sarah will be in the PNW. Where will she be based? I will try to go see her next time I in the area probably for the Seattle Boat show late Jan. ’11. On another note we enjoy following your trip, great photos and commentary and will probably avoid the Med based on your experience. We prefer the few quiet places on this planet and I am sure you two do too. I do not know where Sarah Sarah will be based, other than it will be in the Puget Sound to British Columbia are. For more information contact Todd Rickard.